German chemicals firm BASF has entered the market of composite semi-finished parts for the automotive sector. In this presentation by Dr Andreas Wollny, Marketing Lightweight Composites, Engineering Plastics Europe, he explains the complete Ultracom service package BASF has developed for composite parts. The weight saving trend in the automotive sector is becoming increasingly important as the year 2020 approaches – this is when the CO2 emissions of European automobile manufacturers must comply with significantly more stringent requirements. Thermoplastic materials, with both short and long fibre reinforcement, have made a major contribution to lightweighting today, replacing innumerable metal production components. In the meantime, these plastic components and materials are starting to reach their limits. 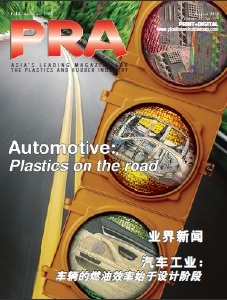 The next big advance in metal substitution in vehicle construction will succeed only with a technological leap, namely, using continuous-fibre reinforcement of injection moulded structures, ie. with thermoplastic composites. Once fully established, thermoplastic and thermoset composites will account for a market volume of about EUR2 billion in the long term. For this reason, BASF is now expanding its activities in the field of engineering plastics to include Ultracom. This is a package comprising continuous fibre reinforced semi-finished products, adapted overmoulding compounds and the complementing engineering support. The key innovations in this new approach are laminates based on woven fabrics and unidirectional (UD) tapes that are fully impregnated with Ultramid or Ultradur, the polyamide and PBT materials from BASF. These thermoplastic composites are being enhanced in a development cooperation together with TenCate, a fibre-reinforced composites manufacturer, and Owens Corning, a supplier of glass fibres. The second component of the Ultracom package consists of the overmoulding materials that have been developed specifically for use with these laminates. These materials are also from the Ultramid and Ultradur product lines, this time in the form of compounds. By using them in combination with the laminates and tapes, it is possible to injection mould complex parts that have very high mechanical reinforcement by use of continuous fibres at precisely defined locations, while simultaneously incorporating specific functions as the result of overmoulding. 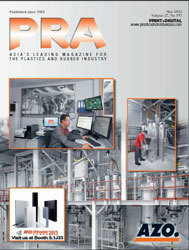 At the K2013, BASF will showcase the first commercial Ultracom product packages. For customer projects requiring parts of high stiffness, the package consists of an Ultralaminate based on polyamide 6 (or an Ultratape if highly directed reinforcements are needed) in combination with Ultramid G12 COM with 60% glass fibre reinforcement as an overmoulding compound. For crash loaded applications with a special need for impact strength, BASF offers a package, which is optimised for high energy absorption. This package consists of Ultralaminate and Ultramid ZG7 COM. In this case, Ultratape exists for local reinforcement, for example as required in seat structures. It can be overmoulded with the same Ultramid ZG7 COM. For the time being, the orthotropic Twill-2/2 structure, familiar from technical textiles and polyamide 6, will be used for the laminates. The third component of the Ultracom package covers the engineering support provided by BASF. This includes not only assistance in the form of designing the part on a computer with the aid of the universal simulation instrument Ultrasim, but also support when it comes to processing the material and manufacturing the part. For this purpose, BASF has added a fully automated pilot line combining an injection moulding system with automated laminate feeding at its technical centre. The engineering support, is not just an option that can be used when necessary, as it was in previous lightweighting projects. It is an essential component of all customer projects. Without the ability to optimise design and production and to describe the behaviour of the composite materials and the parts numerically via integrative simulation as in the case of the conventional short and long fibre-reinforced thermoplastics, a successful full scale market launch would be difficult to achieve. In recent years, the Ultrasim has made it possible to develop and design many new parts such as transmission cross beams, engine mounts, engine supports and metalfree front ends. Laminate or tape-based thermoplastic composite parts will be a viable solution for high-volume production only if integrative simulation is supplemented by new material models and underlying experimental findings. The first Ultramid production application on the basis of overmoulded thermoplastic laminates, at that time, still produced externally, appeared in 2012 in the form of the seat pan for the Opel Astra OPC. For this application, it was already possible to use the expanded capabilities of Ultrasim. They are now available to all customers in the context of joint development projects. On the material side it is a prerequisite and at the same time a challenge to ensure an optimum combination of fibre and polymer on the one hand and tape or laminate and overmoulding compound on the other hand. They must match each other perfectly like a lock and key. The fibres must have a surface sizing formulated for the specific polymers that they are impregnated with and vice versa. Overmoulding materials, in turn, must satisfy the typical requirements for injection moulding while simultaneously permitting optimum bonding/adhesion of ribs to the laminates in a fast process. At present, the greatest technological obstacle is the development and introduction of highly automated and robust process technologies, which will also lower the process costs. 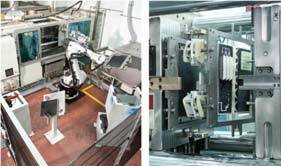 Currently integrated systems consisting of injection moulding machines, moulds, automatic positioning equipment and heating structures are not available off the shelf, neither are the individual elements matched to one another. When they become available, thermoplastic composite parts reinforced with continuous fibres will, in the near future, provide the best possible combination of weight savings, cost efficiency and performance for body and chassis components. Fibre laminates or tapes permit production of moulded parts that are reinforced locally along the existing load paths while simultaneously incorporating additional functions and modularisation via conventional injection moulding. The two different types of semi-finished products (laminates and tapes) fulfill different functions. While thermoplastic laminates are fibre fabrics impregnated with thermoplastics, unidirectional tapes require layered arrangements that must first be produced from the fully impregnated fibre tapes to create structures. Thermoplastic laminates are thus better suited for quasi-isotropic hybrid parts with a large surface area, while tape-based inserts are more suitable for local reinforcement of moulded short glass fibre-reinforced parts with anisotropic properties. Working together with customers in the automotive sector, the experts at BASF are giving themselves three years to develop production concepts for thermoplastic composites with continuous-fibre reinforcement for body and chassis parts. All partners in the industry must build up know-how together to develop the materials, the process technology and the market. For its part, BASF intends to spend a high two digit million euro sum on R&D in its composite activities in the next three years. Some customer projects are already ongoing. BASF is ready to contribute its expertise in the formulation and processing to additional customer projects.